Lighten up spaghetti night with lean turkey meat and fresh "zoodles." I have seen already cut zoodles in the grocery stores if you don't want to take the time. Combine turkey, breadcrumbs, egg, parsley, Parmesan, 1 garlic clove, and 1/2 teaspoon each salt and pepper in a bowl. Form into 12 (1 1/2" to 2") meatballs. Heat 1 tablespoon oil in a large skillet over medium heat. Add meatballs and cook, turning occasionally, until brown on all sides, 4 to 6 minutes. Reduce heat to medium-low and gently stir in marinara. Simmer, turning meatballs occasionally, until meatballs are cooked through and sauce is thickened, 14 to 16 minutes. Meanwhile, heat remaining tablespoon oil in a medium skillet over medium-high heat. Add zucchini and remaining garlic and cook until just tender and heated through, 2 to 3 minutes. Season with salt and pepper. Heat broiler to high with rack in the top position. Sprinkle provolone over meatballs. Broil until cheese is golden brown, 3 to 4 minutes. 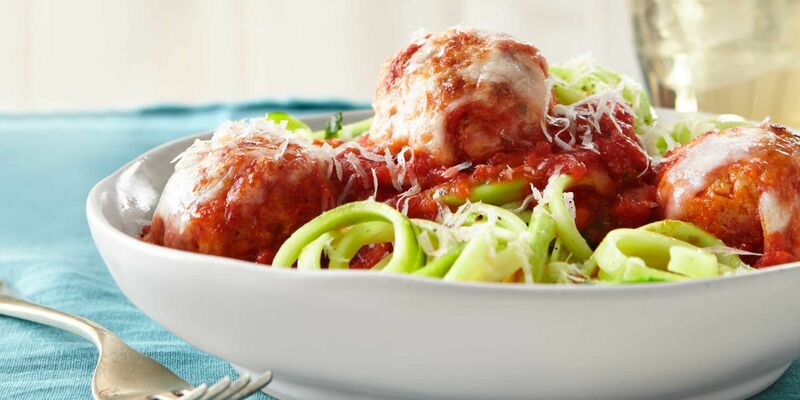 Serve meatballs over noodles topped with Parmesan.